Although it was just a dream (and a really bizarre one too) , it gave me a lot to think about. Having lived in Nebraska for a while, I've had my fair share of "going down stairs." And yes, most of the time nothing happens. Sometimes it becomes so routine that I forgot the seriousness of the situation. In Japan there is a saying: "tensai wa wasureta koro ni yatte kuru." The direct translation means "disasters strike when it is forgotten." The lesson behind the saying is that disasters strike when you least expect them. In 2004 I was staying at my grandmother's house in Lincoln, NE when we were alarmed by a severe thunder storm capable of producing tornadoes. We went down to the basement without too much concern and waited out until the warning was lifted. 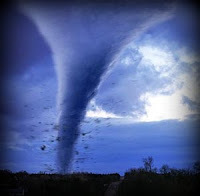 Little did we know there was an F5 tornado headed our way until it changed its course at the last minute. Unfortunately, a small city fell prey to this destructive, uninvited visitor. "A disasters struck when it was least expected." In my dream, having a Survivor 4 Person Kit made me feel a little confident. But in reality, buying a ready-made kit alone is not enough for severe disaster preparedness. There is a great deal of emotional stress involved. When I volunteered to for the clean up effort after the tornado struck, there was a sense of loss as I looked upon places where buildings and houses used to stand. Now, it was thought someone came and ran over the buildings with a bulldozer and dumped garbage on top of them. The clean up crew was instructed to look for and collect items that belong to the victims that they would appreciate. Those items were then gathered in a location where the victims can come and look for their personal belongings. Pictures of loved ones suddenly held more value than they ever did. A watch, a comb, a knife that your father gave you, etc. Anything that could bring back the sweet memories shared with families and friends in a home that once stood were collected and gathered. In preparing for disasters, we should remember the wisdom in expecting the least expected. Ask yourselves; what's the most important thing in my life? What can I do today to protect them in times of disasters? Does your family know that you love them? Where can you go if your house becomes no longer available as your shelter? These are questions worth pondering and discussing with your loved ones. 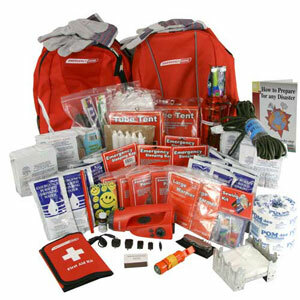 Buying a 72 hour kit is only the beginning of emergency preparedness. Make sure to include items you don't want to lose (family pictures, journals, important paper work, etc). Obviously it is impossible to take everything with you, but you can take quite a bit if you store these things electronically on a flash drive, CD, etc. They are lighter and smaller than carrying actual photo albums, books, and journals. I hope we will all be wise and prepare for the least expected and by so doing, we will find ourselves enjoying the peace that only comes by knowing we are prepared.